The mystery of how so many supermassive black holes were formed in the Universe’s earliest days is becoming clearer. In new research by scientists at the Georgia Institute of Technology, Dublin City University, and others, the mystery of the primordial formations of supermassive black holes may have finally been solved. Light reaching us from the event horizons of black holes 13 billion light years away, suggesting they formed not long after the Big Bang, have remained a dogged mystery for many scientists studying the oldest structures of the Universe. It has long been thought that supermassive black hole formation occurred in regions of space that are heavily bombarded by powerful radiation from galaxies in close proximity, but that is almost impossible for some of the oldest supermassive black holes we’ve detected because they are older than all but the oldest galaxies. Researchers at the Georgia Institute of Technology and others have shed light on the formation of these primordial omnivores. Using a powerful supercomputer to model the conditions in the millions of years after the Big Bang, the researchers found that these structures formed in dense, starless pockets of pre-galactic gas, away from other galaxies. In most cases, these gases coalesced into stars and then into galaxies, but sometimes this process is disrupted. 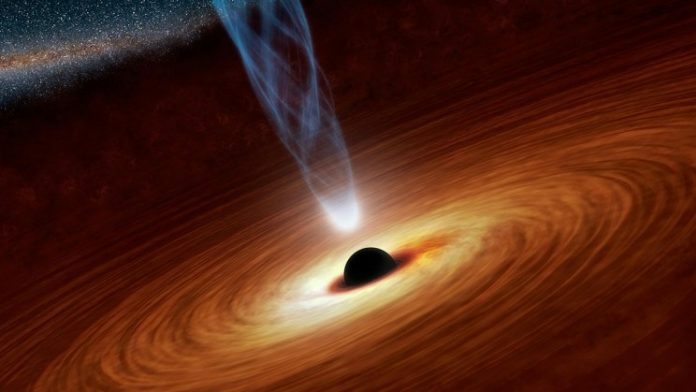 The study, published in the journal Nature, showed that when a galaxy forms quicker and more violently than is typical, the usual process of star formation can be short-circuited and that supermassive black holes can be created from what is left over. Dark matter, the invisible substance that pervades the universe but whose gravitational effects can be seen, filled the primordial universe a few hundred million years after the Big Bang. As a galaxy forms, dark matter collapses into a halo that helps bind the galaxy together. If the growth of these halos is too quick too soon, it can disrupt the mechanism of star formation in the pre-galactic gases. As the gas pockets grow from gases pouring into the increasing gravity well of the galaxy, existing black holes will soak up all of the excess gas that would normally have fed the growth of the billions of stars that make up a galaxy, eventually becoming a supermassive black hole. “In this study, we have uncovered a totally new mechanism that sparks the formation of massive black holes in particular dark matter halos,” Says one of the authors of the study, John Wise, an associate professor in the Center for Relativistic Astrophysics in Georgia Institute of Technology’s School of Physics. “Instead of just considering radiation, we need to look at how quickly the halos grow. We don’t need that much physics to understand it – just how the dark matter is distributed and how gravity will affect that. Forming a massive black hole requires being in a rare region with an intense convergence of matter. The study upended the previously accepted theory over how these structures form, according to John Regan, a research fellow in Dublin City University’s Centre for Astrophysics and Relativity, who participated in the study. “Previous theories suggested this should only happen when the sites were exposed to high levels of star-formation killing radiation,” said Regan. “As we delved deeper, we saw that these sites were undergoing a period of extremely rapid growth. That was the key.